Look forward to working with PCI again in the future! A few weeks ago, I had the pleasure of meeting with the lovely Louisa Jewell, president of the Canadian Positive Psychology Association. We had a Skype conference about my upcoming invited talk on the Body and Positive Psychology at the CPPA Conference, held this July in Ottawa, Ontario, Canada. We have been so lucky to receive an intern grant to work with a student at UEL on a very exciting and innovative project. Led by Professor MarkMcDermott and myself, we are going to supervise a grounded theory analysis on the links between mortality awareness and well-being. Watch this space for results! This week the MAPP team learned that we were all nominated for the UEL Student Led Teaching awards 2014! Congrats to Marcia Wilson and James Beale who went on to win! Thanks to those who voted for us- really special! Article “Eat Smart, Move more, Be happy” (January 2014 edition). Over the next few months, researcher in Scotland will be hosting three information sharing events, called “walkshops” focused on the links between walking and well being. These walkshops aim to put theory into practice and will ensure that attendees are more active than during the usual workshops. The three walkshops will have a variety of attendees from researchers, practitioners and policy makers and will run from March 31st- June 2014. I will be speaking at the first walkshop with Prof Rich Mitchell. I am so pleased to announce that the MAPP team have a new, second year textbook coming out this summer! Lomas, T., Hefferon, K. & Ivtzan, I. (2014). 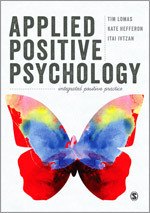 Applied Positive Psychology: Integrated Positive Practice. Sage Publications. It is with great excitement that I can announce that we have officially opened the first Posttraumatic Growth Research Unit at the University of East London. Part of the School Health Promotion and Behaviour Research Group the Post Traumatic Growth Unit specialises in research pertaining to the experiences and facilitators of the phenomenon Posttraumatic Growth (PTG). The unit primarily focuses on the role of physical activity, sport and the body (embodiment) in the process and as a facilitator of PTG as well as other positive psychological interventions (e.g. mindfulness). The unit consists of members of the MAPP UEL team as well as PhD candidate Hanna Kampman. Please visit the website to see our current projects, publications and talks on PTG. Thanks so much for the feedback and great to know that there are others out there looking into the same areas of research.